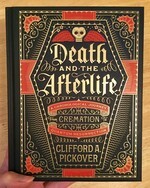 Log in to get emails when Clifford A. Pickover has something new. Clifford A. Pickover is an author, editor, and columnist currently employed at the IBM Thomas J. Watson Research Center in Yorktown, New York. He's been granted over three hundred U.S. patents, authored over fifty books, and is also editor-in-chief for the IBM Journal of Research and Development and a Fellow for the Committee of Skeptical Inquiry. His main writing subjects include science, science fiction, innovation, math, and creativity.